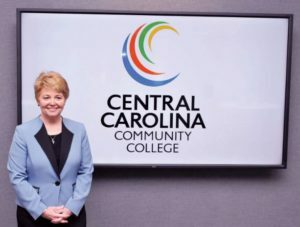 Lisa M. Chapman, the N.C. Community College System’s former senior vice president and chief academic officer, began her presidency of Central Carolina Community College on April 1. She succeeds the retiring T. Eston “Bud” Marchant, who served as CCCC president from Aug. 15, 2008, until his retirement last week. Before going to the state level in 2014, Dr. Chapman had been with CCCC for 27 years. At the college, she held the positions of instructor, chair of the math and science department, academic dean, vice president of academic affairs/chief academic officer and executive vice president of instruction/chief academic officer. CCCC Board of Trustees Chairman Julian Philpott said Dr. Chapman is strong both as an educator and an administrator and he looks forward to what she brings to the college. N.C. Community College System President Peter Hans praised not only Dr. Chapman, also her predecessor for what he left behind. While at the college, Dr. Chapman was instrumental in the establishment of Lee Early College, a partnership between Lee County Schools and CCCC. She was a leader in developing the college’s bioprocess technology program, the first in North Carolina, and the barbering program, the first at a community college. She developed the college’s Division of Student Learning, whose purpose is to increase student success. In 1995, her peers at the college named her CCCC’s Instructor of the Year. In 2012, the N.C. College Personnel Association recognized her for outstanding service in support of the profession for her continuing efforts to improve instruction at the college level. Dr. Chapman holds a doctorate of education degree in curriculum and instruction from the University of North Carolina at Chapel Hill; a master’s in physiology from East Tennessee State University and a bachelor’s in zoology from UNC Chapel Hill. “I worked my last day at NIEHS on Friday, began at the college on Monday and taught my first class on Wednesday … and fell in love with teaching and working with adult students,” said Dr. Chapman. She is married to Jeff Chapman, a 1987 CCCC automotive technology graduate. Their son, Brandon, earned his associate in arts degree at the college. Their daughter, Katie, and daughter-in-law, Lindsay Chapman, have also taken classes at the college toward degrees they received at other institutions. What does she think makes CCCC such a special place?